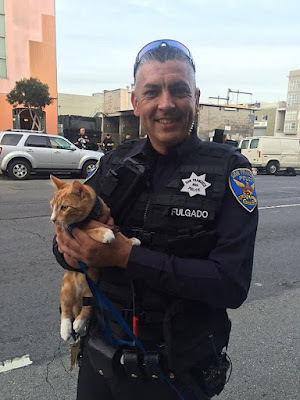 As the standoff between San Francisco police and a suspected car thief threatening to jump from a South of Market building crept into its third hour Wednesday evening, officers turned to an unlikely source to help them talk the man down: his cat. The man, barefoot and wearing only black shorts, was distraught and hanging out of a third-floor window of a building at 10th and Harrison streets, threatening to leap. Officers set up foam pads below him as the department’s trained hostage negotiators perched precariously on a fire escape, urging the suicidal man figuratively and literally off the ledge. But after three unsuccessful hours, reinforcements arrived — in the form of the man’s orange-and-white feline. Using his pet, hostage negotiators were able to persuade him to go back inside the building, come down the stairs and surrender without incident. Within 45 minutes of the cat’s arrival, the 3½-hour standoff was over. The man had run into the building about 2:30 p.m., after he had been stopped while driving a white Toyota Highlander that had no license plates. While California Highway Patrol officers questioned him, he sat on a sidewalk. When a computer check showed that the car was stolen, the man jumped to his feet and ducked into the building, CHP officials said. San Francisco police responded to the scene once the situation devolved from a traffic stop to a possible suicide attempt. Officers from the hostage negotiation team, the tactical unit, the motorcycle unit, the traffic division as well as Southern Station arrived to aid in the standoff, Esparza said. A common strategy in these situations is to call the family of the person in crisis, in hopes a loved one can talk them down, Esparza said. The man’s family was on its way from the East Bay as negotiators gently spoke to him from the fire escape. When police learned the man’s relatives brought his cat to the scene, officers took it up to the negotiators. Shortly after 6 p.m., the man went back inside the building and the standoff was resolved. Esparza said he never got the cat’s name, but he applauded the officers for their quick thinking, as well as their sensitivity. Even as the man was handcuffed and taken to a police car, officers brought the cat to him so he could see his beloved feline before going to jail.